Stuff Points: Earn 35 points when you buy this stuff. Save money when you buy these three items together. 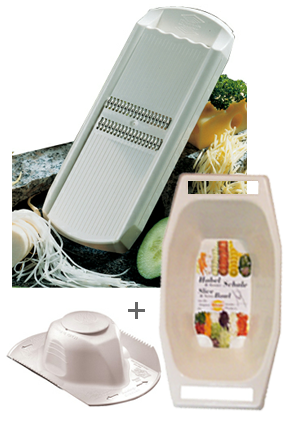 We recommend using the borner safety food holder in conjunction with the Julienne Slicer. Using both products together produces the best results and ensures the safest operation. The food holder will allow you to slice your food faster, and it will make sure you have all of your fingers when finished. The slice & Serve Bowl allows you to mount your borner slicer so that everything you slice falls neatly down into it. This will give you support while slicing, but it also allows for storage or serving after you are done slicing. These parts sell for much more if purchased separately, so buy them together and save. This combo pack is the safest, and most convenient way to enjoy the Borner Thin Julienne Slicer and offers the best value for your money. Order your Slice & Serve combo pack today! Safety Holder Included Yes. As an option. More info here: food holder - save money when you buy them together. Borner Thin Julienne Slicer - High quality materials and craftsmanship make this German made kitchen gadget a must have. A great accessory for anyone that enjoys cooking. Make perfect shreds from your favorite fruits and vegetables. Great for carrots, apples, cabbage, cucumbers and more. Borner Safety Food Holder - High quality materials and craftsmanship make this German made kitchen gadget a must have. A great accessory for anyone that enjoys cooking. For use with all Borner slicers. On the plus side this slicer has a good, sharp metal part, and creates a uniform, thin shreds. On the minus side plastic is so thin that it bends when you slice something hard, like carrots I was afraid it will break. German Made For Superior Quality. Clean Like Magic! Triple Blades With Double Sided Cutting Power. Cut Like a Pro!